Should you hop aboard the Google+ bus? You’re a busy corporate leader. Here’s ANOTHER social media platform to launch! 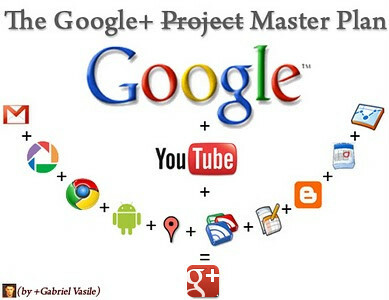 Google+ is the social networking arm of the Google empire. By sheer mass & universal reach, it can’t be avoided & certainly it offers the most comprehensive collection of free wikis, apps, communications tools, analytics, & APIs that can be incorporated right into your own web address. 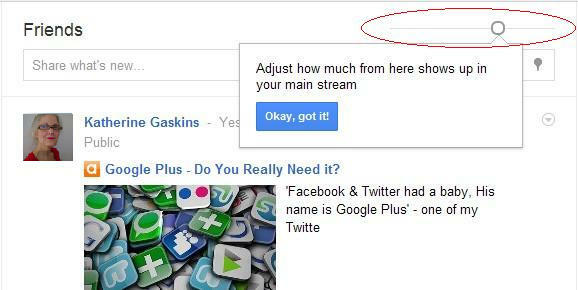 Do you need to add Google+ to your arsenal of social networks? YES!!! You can’t ignore it. Google+ is big & growing fast. Google+ is expected to total 100 million global subscribers this month, 7 months after its launch. It took Facebook 4½ years to reach that number; Twitter, 5. Tangentially, however, it must be admitted that Facebook was the first to create the quantum change in social user behavior. Growing at the rate of 625,000 subscribers per day, Google+ is expected to have more than 400 million users by the end of the year. This link gives a great visual overview of the features, including Hanging & Uploading/sharing photos & videos, but it editorializes a lot at the end, views we are not promoting & may not share. We are mentioning Google+ here because we are most concerned with its importance as a social media marketing tool for business. But, wait! What about this? 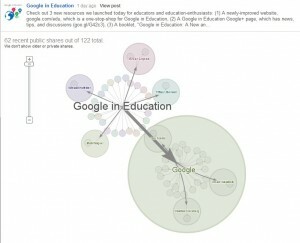 Google search in January launched SPYW—search + your world—& it’s intimately entwined with Google+. From an SEO marketing professional’s perspective, SPYW could be the answer to a dream. SPYW analyzes Google+ & brings Google+ data that’s been privately shared (your recent photo shares, posts, profiles of others in your circles, related people & pages) to the top of your search, where you’re sure to (remember &) find them. Google says it has incorporated the personalized + element to make each search more meaningful to each user. However, Google’s SPYW aroused accusations that Google is now skewing search results in favor of Google+ over its social networking competitors, Twitter & Facebook. Preliminary search tests seemed to support this. For example, Joel Mathis of MacWorld reported that AT&T’s Google+ page appeared high in the rankings in a search for AT&T. When he clicked the ‘Don’t be evil’ bookmarklet, AT&T’s Twitter page appeared first. Read more here. The ‘Don’t be evil’ bookmarklet was created by engineers at Facebook & Twitter, using Google’s own algorithm formula for search, to weight Google+ search results evenly with all other results. Certainly there is competition for producing real-time social networking results. For example, Twitter feeds its activity to Topsy, a social web browser, that allows you to search specifically for real-time tweets, & has a Twitter index that goes back to 2008. You can search for tweets by subject x expert. Google can still find tweets through its regular crawling, but, compared to Topsy’s results, they may not show up in a Google search as fast. … most people are jumping to a conclusion based on the first two weeks of the product. We’re designing a product which it will work for all individuals. It will have identities as a fundamental ingredient of search and relationships as another fundamental ingredient of search. But, basically what you have at the moment is a new comprehensive social networking platform (Google+) that is integrated intimately with the world’s largest search engine (Google search) that yields highly personalized search results, which may give preference to Google+ social activity, along with the highly honed organic results we now assume from Google. Okay. Now what does Google+ mean for corporate branders? The Google+ interface is easy, with the main editing/customizing icons—HOME, PHOTOS, PROFILE, CIRCLES & GAMES—easily accessed right from the top. In fact, Google believes it’s so easy, there is no ? or help button on the pages. You can filter how much content floods your main stream. While the streams aren’t infinitely adjustable (by person in each circle or for inclusion by keyword), this feature is better than simply “blocking” feeds from vocal contacts. Targeted sharing is easily segmented. 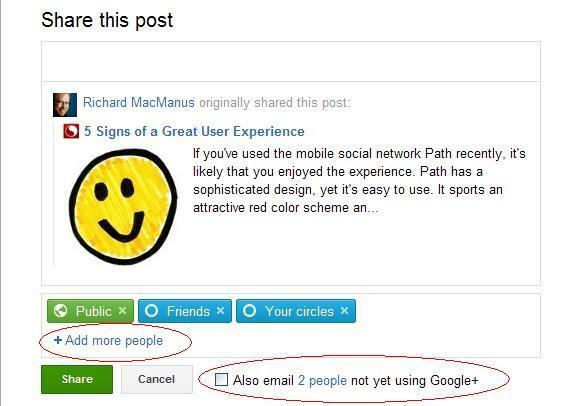 The “circle” concept makes Google+ targeted sharing very simple. Friends can live in multiple circles, so, if you’re going to develop circles for specific shares, it’s easy: your friends can be in your “Friends” circle & in your “Biz news” circle, too. By contrast, Twitter lets you create public or private “lists”, but your “followers” can be included in only one of them. If you’re using Twitter for social media networking & marketing, this means you can’t finely segment your followers for specific info & messages, but, with Google+, you can. Google+ “share” also let’s you specify to which individual friends your message/share can be sent. You can share with many individuals or only one. Google+ Pages allow you to create separate (brand?) identities under your Profile account. The pages are considered “entities” rather than personal “profiles” & are designed to promote communication about & traffic to particular products, services, brands, interests. Pages can have multiple administrators. You can Direct Connect with a specific Google+ page by simply inserting a “+” in front of its name in Google’s search field, for example, +Google+. Hanging Out gives everyone the ability to video or audio conference, live. The faces of customer service & sales are no longer blank or anonymous. This means that for each + product page, interaction is live between you & your customers. And,it’s free! You get many of the features of live conferencing software, such as the ability to upload presentations, photos & videos for live view during the conference, the ability to IM-chat privately with any particular person, individually, during live sessions, & the ability to mute other parties. No need to be in the same room, to watch movies together, anymore. You can upload a favorite film & watch together in the hanging out space. Another nice feature,particularly between friends, is that the center screen view switches to each speaker as they speak, when in video-conference mode. Here’s a great, short video demonstration of these features. Ripples gives you a visualization of how (& where) your post was shared & reshared. When you click on Ripples, the sharing & resharing of your posts are automatically shown on a heat map & plotted in a qualitative bubble flow graph with an animated timeline, which can be accessed by clicking Ripples in the comment widget dropdown box. 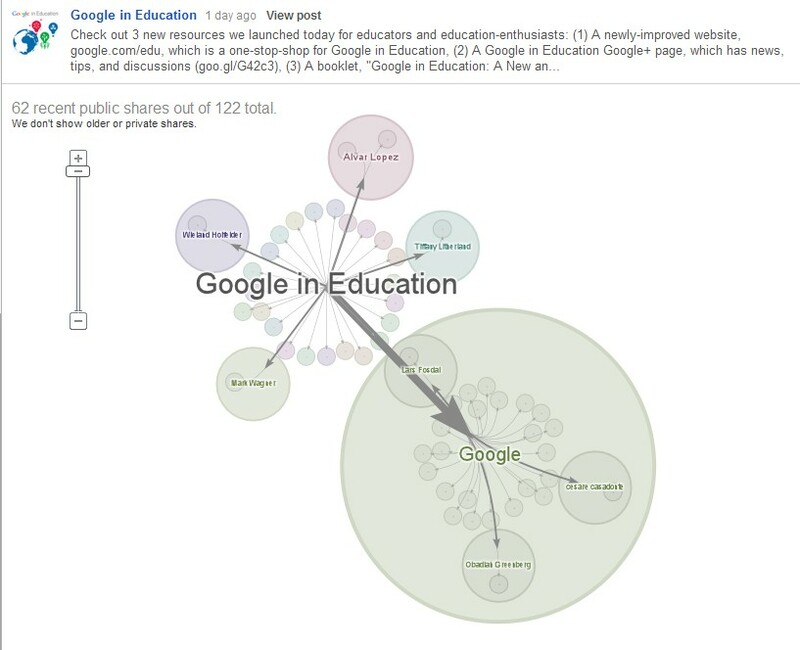 This is fantastic to measure the reach, and influence in your Google+ network. How does Mobile relate to SEO, social marketing & Google+? Google adwords, SEO (search engine optimization)—and similar programs—are only now gaining inroads as a driving force in corporate marketing consciousness, particularly small business consciousness. Yet, mobile technology, availability, & use by consumers is already 3 to 5 years ahead of corporate & small business mindsets. If your mobile website is not already in development, you’re going to be way behind. With 1 in 7 searches now mobile & 1 in 3 of those searches now local, your campaign, brand, and identity are not going to be accessible to the way your consumers search &, effectively, as far as the consumer is concerned, you’ll be closed for business or won’t exist (paraphrase of Jason Spero, Head of Google Mobile Apps). PC & mobile photo-editing & sharing are easy on Google+. Google+ uses Picasa photo album (a free Google software & virtual platform, soon to be called Google Photos). Picasa has a simple, intuitive interface that let’s you edit, crop, alter or add effects to your photos, which can be stored on your PC or virtually, online. Sharing photos with your Google+ Circles is as simple as click click click. A great short video about the Google+ photo ‘Creative Kit’ is here. Instagram, already available for iPhones & iPad, is being designed for Google’s Android mobile software, which now runs more than 50% of the world’s smartphones. 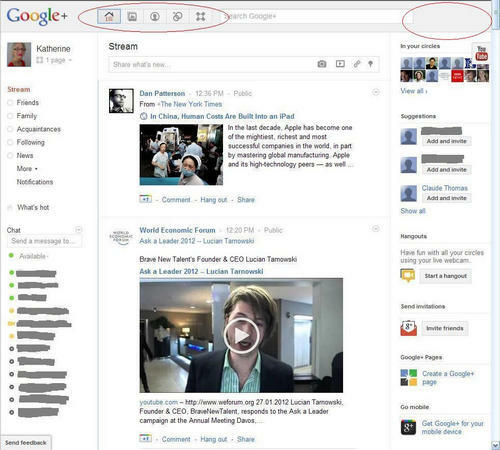 Will Google+ take you to new worlds? It might. Certainly the trip will be more fun with its exceptionally friendly user interface, easy-to-find menus, & it’s integrated interface with every collaborative medium or tool that you might need to communicate easily with your business associates, customers, clients, & friends.